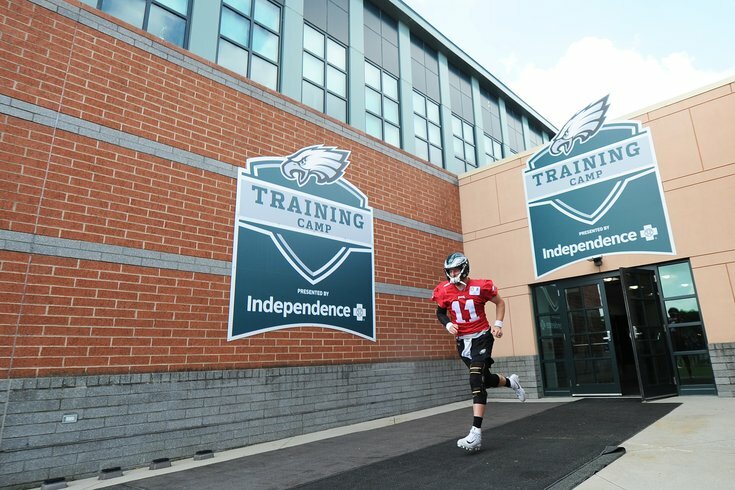 The first day of Philadelphia Eagles training camp is in the books, and as expected, Doug Pederson had a light day to let his players knock off some of the rust. Pederson ran a "10-10-10" practice, which are designed to give the offense 10 reps against something of a scout team defense, then 10 plays for the defense to run against a scout team offense, and some special teams work. In other words, there isn't a lot of true competition in these practices, so we won't focus much on the results of the plays the team ran today. • A half hour before practice started, the Eagles announced that five players – Brandon Graham, Alshon Jeffery, Chris Maragos, Timmy Jernigan, and Bryce Treggs – were all placed either on the PUP (physically unable to perform) list or the NFI (non-football injury) list. We covered the PUP and NFI lists earlier today in case you need to catch up on all that. While it’s not the best news that those five guys aren’t ready for the start of camp, the good news is that a number of the other Eagles recovering from injury looked good. There was an erroneous report that Carson Wentz would start the season on the PUP list. He not only practiced, but he also got in for a handful of reps in 11-on-11’s, which is something he had not done during spring practices. Jason Peters also participated in 11-on-11’s, something he had not done during the spring, and looked like the Jason Peters of old in terms of quickness and agility. Darren Sproles looked like the same player he has always been during his Eagles tenure in the opportunities he got to run with the football today. Haloti Ngata participated in 11-on-11’s. He did not practice at all during spring practices. I can’t really say how he looked because I’ve never seen him practice, and therefore cannot make any comparisons. • Trying to evaluate offensive linemen is too difficult to do when the players aren't in pads yet, but we will note quickly here that Isaac Seumalo sailed a pair of horrendous snaps over the head of 6'6'' quarterback Nate Sudfeld. • I'll also quickly point out that Halapoulivaati Vaitai's kick slide looked quicker than I've ever seen out of him. • As the Eagles continue to try to sort out who will play slot corner this season, one notable observation from the defense today was that Malcolm Jenkins played the slot while Rodney McLeod and Tre Sullivan were at safety. Jenkins loves playing the slot, and he could be in the mix there as well if one of the safeties steps up and proves that he can be trusted on the field. That would be almost seven offsides penalties per season. Bennett does get a lot of tackles for loss, and his aggressiveness at the snap is part of the reason why, but offsides penalties can be killers, especially if you're going up against a quarterback like Aaron Rodgers, who loves drawing guys offsides with hard counts and then taking shots down the field on free plays. • Steven Means got a "sack" today in a 10-10-10 practice and then did his patented sack dance. I love the enthusiasm, but maaaaayyyyyyybe dial it back a shade, Steven. • I think I mentioned this during the spring, but just in case I didn't, but Donnel Pumphrey looks less shrimpy than he did a year ago. • Punter Cameron Johnston was highly erratic today. He got 15 punting reps, and I clocked them all for hang time. He did hit two bombs, but had five shankopotamuses (or is it shankopotami? ), including three shankopotami in a row. To note, it's possible that Johnston was trying different punts, but it didn't look that way to me. It looked like the practice was set up for him to just blast away. In any scenario, the five shankopotami were bad punts no matter what he was trying to do. I would bring in competition.